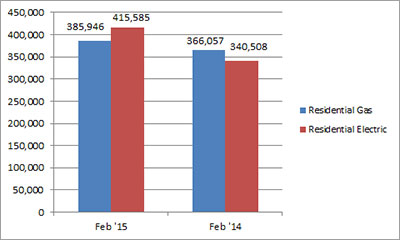 U.S. shipments of residential gas storage water heaters for February 2015 increased 5.4 percent, to 385,946 units, up from 366,057 units shipped in February 2014. Residential electric storage water heater shipments increased 22.0 percent in February 2015, to 415,585 units, up from 340,508 units shipped in February 2014. For the year-to-date, U.S. shipments of residential gas storage water heaters increased 8.3 percent, to 798,356, compared to 736,907 units shipped during the same period in 2014. Residential electric storage water heater shipments increased 17.1 percent year-to-date, to 822,438 units, compared to 702,211 units shipped during the same period in 2014. 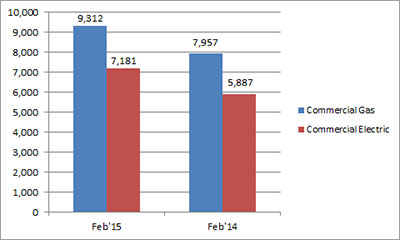 Commercial gas storage water heater shipments increased 17.0 percent in February 2015, to 9,312 units, up from 7,957 units shipped in February 2014. 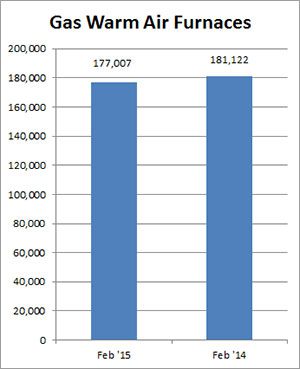 Commercial electric storage water heater shipments increased 22.0 percent in February 2015, to 7,181 units, up from 5,887 units shipped in February 2014. Year-to-date U.S. shipments of commercial gas storage water heaters increased 14.1 percent, to 17,303 units, compared with 15,163 units shipped during the same period in 2014. Year-to-date commercial electric storage water heater shipments increased 13.2 percent to 12,705 units, up from 11,221 units shipped during the same period in 2014. 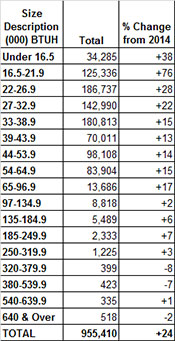 U.S. shipments of gas warm air furnaces for February 2015 decreased 2.3 percent, to 177,007 units, down from 181,122 units shipped in February 2014. 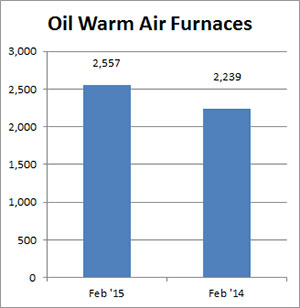 Oil warm air furnace shipments increased 14.2 percent, to 2,557 units in February 2015, up from 2,239 units shipped in February 2014. Year-to-date U.S. shipments of gas warm air furnaces decreased 5.0 percent, to 371,064 units, compared with 390,789 units shipped during the same period in 2014. Year-to-date U.S. shipments of oil warm air furnaces increased 16.7 percent to 5,385, compared with 4,615 units shipped during the same period in 2014. U.S. shipments of central air conditioners and air-source heat pumps totaled 475,926 units in February 2015, up 19.9 percent from 396,863 units shipped in February 2014. U.S. shipments of air conditioners increased 22.3 percent, to 295,479 units, up from 241,546 units shipped in February 2014. U.S. shipments of air-source heat pumps increased 16.2 percent, to 180,447 units, up from 155,317 units shipped in February 2014. 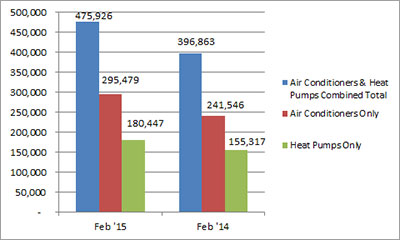 Year-to-date combined shipments of central air conditioners and air-source heat pumps increased 24.5 percent, to 955,410 units, up from 767,445 units shipped in February 2014. Year-to-date shipments of central air conditioners increased 27.9 percent, to 583,840 units, up from 456,608 units shipped during the same period in 2014. The year-to-date total for heat pump shipments increased 19.5 percent, to 371,570 units, up from 310,837 units shipped during the same period in 2014. NOTE: Industry figures are estimates derived from the best available figures supplied by a sample of AHRI member companies and are subject to revision. 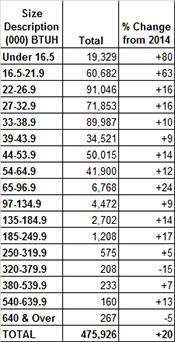 Year-to-date figures are correct as issued.